Mike Prichard was given an inauspicious beginning to his life, his biological mother having been a heroin addict that was compelled to give him up for adoption when he was still a baby. His adoptive parents divorced six years later, and for a while he was stuck in the situation of having to divide his time between two households. In the fifth grade he found a supportive friend in Billie Joe Armstrong, eventually moving away from his own family to rent a room in Armstrong's house, while working alongside both Billie Joe and his mother at a local restauraunt. Around this time both Prichard and Armstrong developed an interest in the Bay Area punk scene and formed the band Sweet Children, actually playing their first show in the restaurant where they both worked. Over the next two years Sweet Children managed to establish a strong reputation for themselves within the local punk crowd, after which -- with the addition of drummer John Kiffmeyer (working under the name Al Sobrante) -- they changed the band's name to Green Day and signed to the independent Lookout! label. After releasing two albums and two EPs with Lookout! -- 1,000 Hours (1989), 39/Smooth (1990), Slappy (1990) and Kerplunk (1992) -- Mike (now "Dirnt" instead of "Pritchard") and his bandmates (now Armstong and drummer Tre Cool instead of the college-bound Kiffmeyer) had accumulated such a degree of popularity that the unwholesome eye of corporate record industry was inevitably drawn in their direction. The three musicians quickly succumbed to the industry's (in this case, Warner subsidiary Reprise Records) advances, and the first fruits of their union arrived in the form of Dookie (1994): a chart-topping, Grammy-winning album that also contained the groups first number-one single When I Come Around. The formula was successfully repeated with 1995's Insominac, but constant touring and promotion was taking a heavy toll; a scheduled world tour was subsequently cancelled, and the band spent the next year on hiatus, recuperating from the ordeal of mainstream success and getting re-acquainted with their families (Mike himself taking the opportunity to get married). With later albums -- Nimrod (1997), Warning (2000), American Idiot (2004) -- Green Day continued to have an impact on the charts and maintained their high popularity (although the string-laced ballad Good Riddance (Time of Your Life) featured on Nimrod instigated some dissent from the punk-traditionalist segment of their audience), and a shift from their punk roots to a more mainstream rock style became increasingly evident in the new decade. 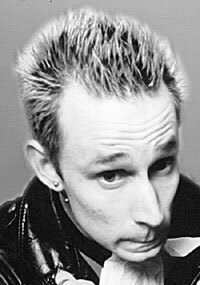 As was the case with bandmate Armstrong, Mike Dirnt maintained an involvement in a number of other bands and side-projects concurrent with his tenure in Green Day: occasionally contributing to records by Screeching Weasel (1994's How To Make Enemies & Irritate People and 2000's Thank You Very Little), working with Crummy Musicians and Squirt Gun, and helming his own band The Frustrators. Alongside both his Green Day chums, he also appeared on Iggy Pop's 2003 Stooges-reunion Skull Ring.